Enjoy the ultimate home theater experience with beFree Sound's 5.1 channel surround sound Bluetooth speaker system. This speaker system is sophistically designed, featuring a sleek look and smooth sound. With Bluetooth, usb, sd and FM radio capability, the system offers the best possible listening options for your enjoyment. 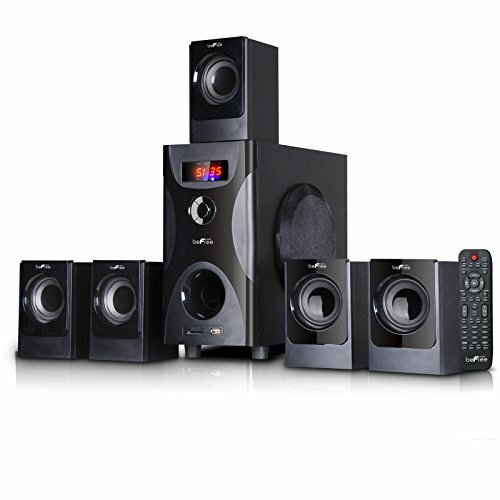 * 4" amplifier x1 + 2.75" speakers x5* output power:20w+5w*5* frequency response:40hz-20khz, * separation:≧50db, * s/n ration:≧75db* features: Usb/sd/FM/Bluetooth/remote.